The Travel Corporation’s (TTC) award-winning family of brands including Insight Vacations, Red Carnation Hotels, Contiki, Trafalgar, Uniworld Boutique River Cruise Collection, and Evan Evans have announced their global partnership with VizEat, the innovative and immersive food experience platform, bringing travelers together by offering unique culinary experiences with their 22,000 local hosts in 110 countries. In 2014, the VizEat app was first launched in Paris and it has now become the world’s most popular meal-sharing platform, with guests being welcomed into a global network of hosts’ homes while making authentic connections with both locals and travelers. TTC’s travel brands will be able to connect their guests to these VizEat hosts, who are trained chefs and home cooks, where they will share their delicious meals and learn about new cultures with other travelers and foodies from across the globe. They will sample regional specialties and traditional cuisine in unique locations with a relaxed ambiance. 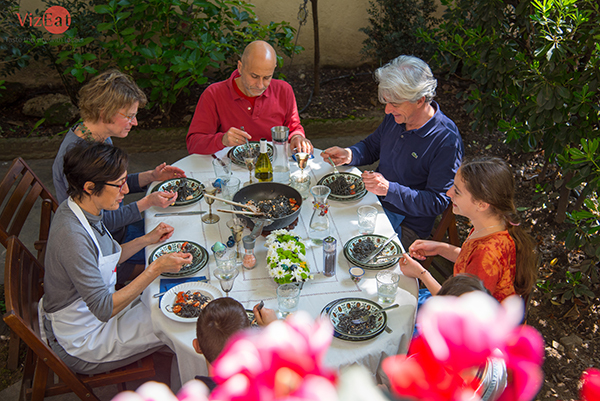 Travelers can enjoy a pasta-making class in Rome, embark on an interactive market tour in Barcelona, indulge in a wine and cheese tasting party in Paris, or join a Tuscan chef’s table and sample gastronomic delicacies. Beginning this summer, TTC’s guests will have an opportunity to enjoy these immersive food experiences on selected trips or as optional experiences, with the assistance of their knowledgeable Travel Directors and Tour Managers. For more information about The Travel Corporation (TTC) and its portfolio of award-winning brands, visit http://www.ttc.com. The Travel Corporation (TTC) is a highly successful international travel group. Our philosophy is simple – to create enriching experiences for our travelers by combining an unbeatable mix of exceptional service and quality at great value. No matter what your taste, whether you are a family or a couple, a group or traveling solo – TTC offers something for everyone. Our multi-award-winning portfolio ranges from luxury hotels and boutique river cruises, to independent holiday package companies and a variety of guided travel experiences. For more information about TTC, visit http://www.ttc.com. VizEat is the largest immersive food experience platform, which connects travelers and local hosts around an authentic culinary experience at their home setting. It is a unique way to exchange with people from all around the world and to discover new cultures around food. VizEat has more than 22,000 hosts in 110 countries. Its website and apps are now available in English, French, German, Italian, Spanish and Chinese. Anyone can sign up to become either a host or a guest. The mobile apps for VizEat are available for download for iOS and Android. Apple selected VizEat in the TOP 3 Apps of 2016 and CEO Tim Cook came for a VizEat lunch in Paris early February. For more information, visit http://www.VizEat.com. Created as a joint initiative between The Travel Corporation’s (TTC) family of brands, The TreadRight Foundation is a not-for-profit that works to help ensure the environment and communities we visit remain vibrant for generations to come. Founded by Brett Tollman, Chief Executive, TTC, to date TreadRight has supported more than 40 sustainable tourism projects worldwide. As an official Diamond Sponsor of the UN International Year of Sustainable Tourism for Development 2017, TTC is dedicated to bringing the industry together with a shared goal of benefiting local communities and the environment. o learn more about our past and current work at TreadRight, please visit us at TreadRight.org.